The Nairobi Serena Hotel is part of the Serena chain of hotels, which has built up an excellent reputation in the East African region. This hotel is no exception. Using environmentally sensitive materials, the interior design of the hotel is Moroccan in style and luxurious at every turn. This hotel is very popular, so make your reservations early. It's often booked 6 months to a full year ahead. The subtle African safari style continues into each of the recently renovated guest rooms in the hotel. A number of room are designated as "non-smoking". Besides the standard guest rooms, there are a number of larger executive suites as well. But if you have the chance, take one of the amazing garden suites, where you'll have your own private patio garden with a mini-pergola for eating outside. All of the rooms have a number of features included, such as air conditioners, minibar, satellite TV, wireless Internet hotspots and an in-room safe. There are business services on-site for anyone who does business while they travel, including available boardrooms, secretarial services and currency exchange. Other facilities at the hotel include child care, room service, a hair salon, laundry services, and a valet. There are a few choices for dining and drinking at the Nairobi Serena Hotel, all with Moroccan or African themes. The Café Maghreb is a casual spot for you to try many international dishes while you sit overlooking the pool. The Askum Bar and Pool Bar both serve drinks and snacks all through the day. For more formal dinner dining, you will want to make a reservation at the Mandhari Restaurant. Enjoy a meal of locally grown vegetables, freshly caught fish and other Kenyan delicacies. The view of Nairobi's skyline and Central Park is the perfect compliment to the meal. Within the hotel is the relaxing and decadent Maisha spa, where you can get spa treatments, facials, massages and a number of other scrubs, wraps and rubs. If you prefer some time alone to just relax, there are heated swimming pools, a yoga studio, saunas and steam rooms, Jacuzzis and more. One of the most popular attractions, found just outside the city of Nairobi, is the Nairobi National Park and animal orphanage. It’s a full wildlife resort complete with lions, rhinos, giraffes and zebras and vastly underrated. The National Museum of Nairobi is only 2km from the hotel, as is the Phoenix Theatre. These are prime destinations if you are looking to add a bit of history and culture to your trip. The Nairobi Serena Hotel is located right on the border of Central Park, and across from the famous Uhuru Park where public meetings and rallies are often held. This is not a place to walk around alone after dark, so take a taxi if you want to go out at night. The hotel is only 20 minutes from the city's international airport. You can walk right to the city center in only 5 minutes. 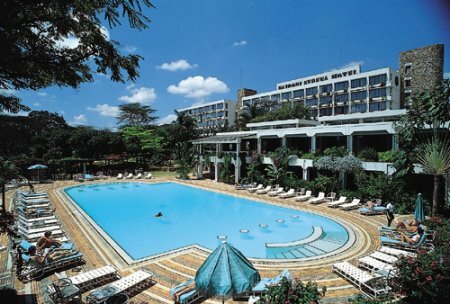 All in all, the Nairobi Serena Hotel is a great place to stay if you want to explore the city life of Nairobi. For more information or a booking, check this hotel at Africapoint. This friendly and patient Nairobi-based travel agency knows all hotels in Nairobi and can tell you personally whether it's this hotel that suits you best, or another Nairobi hotel.